Project 3 is all about colour. 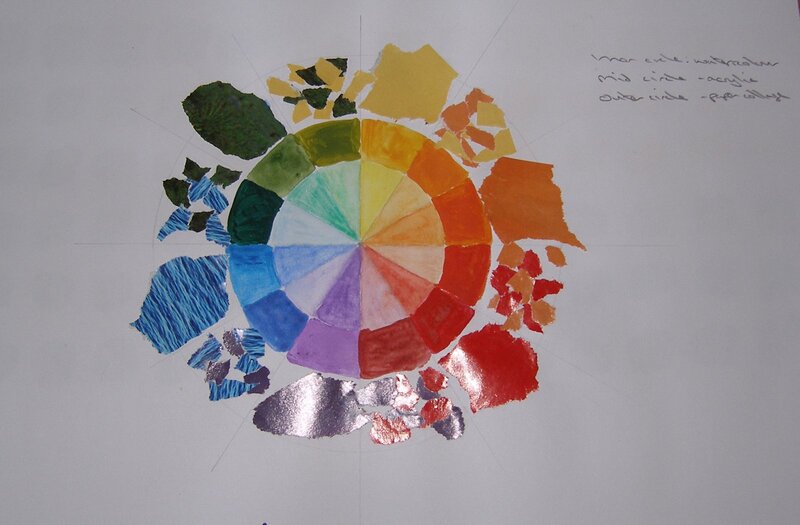 The first stage is learning about colour theory and preparing a colour wheel using different mediums. I made a colour wheel using three different mediums to get a feel for the differences in them and how easy/ difficult it was to produce them. In the photo below can be seen the inner circle in watercolour paint, the middle circle done in acrylics and the outer circle in paper collage. The first interesting point is the large difference in the greens between the watercolours and the acrylic paints. The watercolour produced a very bright green and the acrylic is much more muddy. This is a result of the actual paint colours I had available at the time. For the paper collage circle I tried to find the main 6 colours, and then created the transitions by mixing small torn up bits of the two neighboring colours rather than try to find exactly the right colour in a magazine. The illusion created by the small mixes of colour works better at a distance or through half closed eyes..